Man, was I craving a burger for lunch. Not just a any burger, but a burger I didn’t have to make. I’m going to be working the next couple days, so I was up for going out to lunch today. Whenever I’m craving a burger, I look for a bar. If it’s a sports bar, bonus. I chose Big Deal’s Sports Bar on Drake Road near Main Street in Kalamazoo’s Westwood Neighborhood. 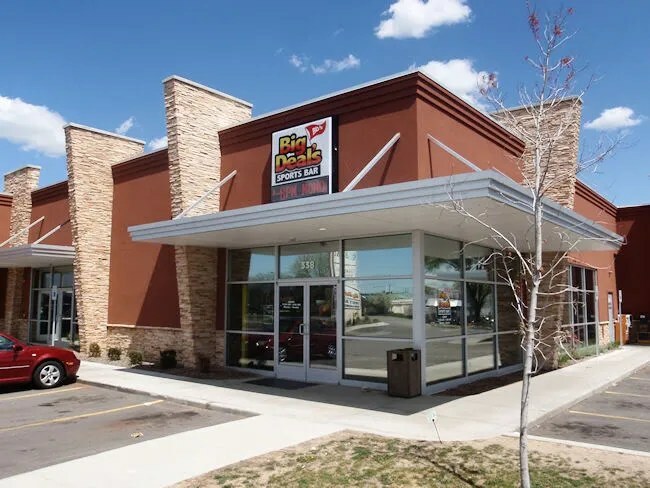 It looks to be a newer building in a newer strip mall with a few other restaurants at a very busy intersection. We were a little past the lunch rush so the place wasn’t all that busy. We took a pub table near the bar and the bartender/waiter/owner (?) came over to see if we were interested in lunch. We told him we were so he grabbed a couple menus and got us some Coke’s. There was no lack of entertainment while we waited for our food. The space at Big Deal’s isn’t huge. There is enough room for a couple dozen tables, a pool table and an L-Shaped bar, but what is really impressive is the TV’s. They almost use LCD TV’s as wallpaper. There are TV’s everywhere. Literally everywhere. The spaces that aren’t taken up by the TV’s are reserved for autographed, framed jersey’s including a few from Derek Jeter. There’s also a huge painting on the wall near the kitchen of the Kalamazoo Central and WMU star. The menu is pub grub which suits us well. J ordered the Deep Fried Chicken Strip Basket. 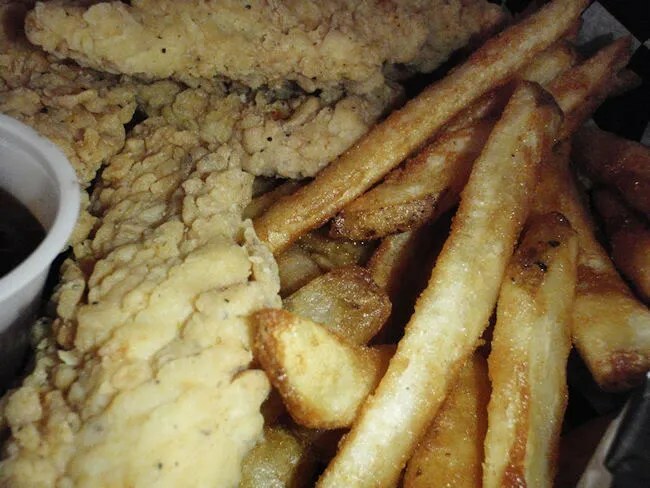 She got four huge pieces of deep fried chicken breast and a pretty healthy order of fries. The basket came with the regular french fries, but she upgraded to beer battered for a buck. There was more than enough food in her basket and she had to make a choice of where to go. Everything was good, but the fries tended to be what she gravitated towards. The beer batter was crunchy and golden brown. That’s not to say the chicken went neglected. I got one piece and it was better than the standard food service chicken strip and much bigger. I got the burger I wanted by ordering the Bacon Cheeseburger. 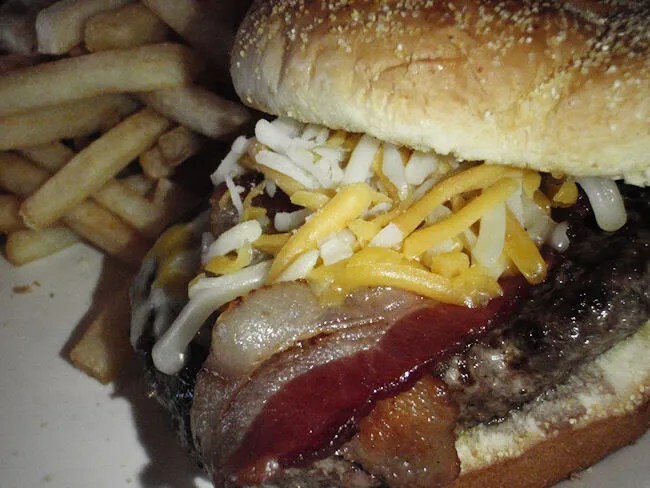 The patty is an Angus beef burger and it’s topped with bacon and shredded cheese then served on a toasted bun. I like the idea of the shredded cheese, but it wasn’t really melted, so it was a little like eating cheese out of the bag. It wasn’t a bad thing or anything that would stop me from ordering it again, but a few minutes covered on the grill would have made a difference. The bun had a really good toast to it and made up for the cold cheese. Such a simple step that adds so much to burger. My sandwich came with fries and I went with the regular fries. The fries were good, but not nearly as good as J’s. Next time, I would pony up the extra buck for the beer batter. It took a little while to get our check because the bartender was also eating lunch. When he did look over and notice we were done he jumped up to print it out. The total came in right around twenty bucks which is perfect. 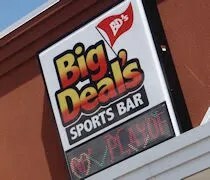 Big Deal’s is the kind of place you go to watch a game. It’s almost a sensory overload, but nothing a die hard sports fan wouldn’t love. I saw their website they have 32 HD TV’s. 32! If you see the size of the place, that number is even more impressive. There is a TV packed in to every corner and they have every sports package there is. The atmosphere is complimented by a pretty good pub food menu and decent specials. If you want to get out of the house to watch the Wings, Big Deal’s is an ideal place to do just that.